Enjoying your favourite foods to their juiciest potential is possible with a high-quality grill from SABER. SABER grills offer excellent performance and a host of features without sacrificing affordability. 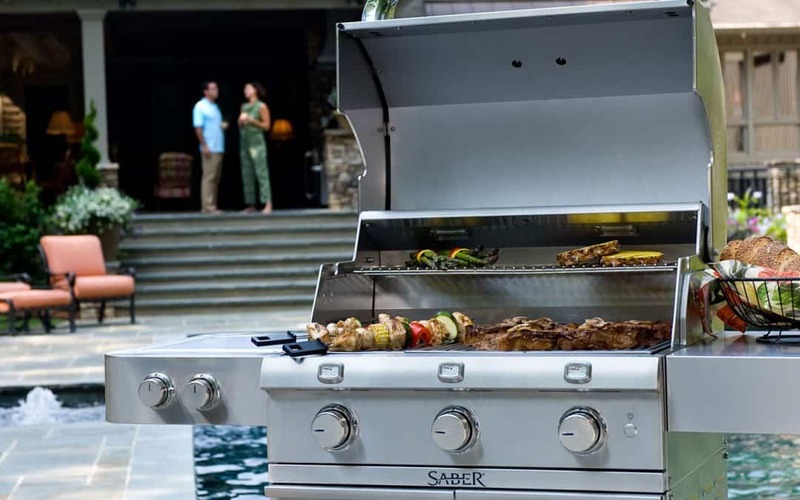 If you’re searching for a new grill, consider the features and benefits that SABER offers. The SABER Patented Cooking System: Infrared heat provides superior grilling with no flare-ups and even, well-controlled heat. Electronic Ignition: Electronic ignition at each burner ensures a reliable start. Grate-Level Temperature Gauges: Want to grill with the lid up? It’s possible, and even recommended, with SABER’s grate-level temperature gauges. Front-Access Grease Tray: Cleanup is a breeze with an easily accessible, and large, tray. Safe and Simple Natural Gas Conversion: SABER’s exclusive EZNG tray converts to natural gas easily. You can do it yourself! Stainless-Steel Cart: A fully enclosed 304 stainless-steel cart makes an elegant addition to your patio. Dual-Control Side Burner: Some models include a 18,000 BTU burner for boiling, wok cooking, or warming. Multiple Cooking Zones: Larger models have up to three cooking zones, which can be used all at once, even at different temperature settings or individually. Traditional gas grills use convection heat, which relies on hot, dry air which diminishes the food’s moisture. On the other hand, SABER’s infrared heat directly cooks your food from the bottom up, not outside in, directing dry air away from the food’s surface. The result? Juicy, tender meats that taste great. The unique design of SABER’s cooking grate prevents flare-ups that can potentially burn meat and create temperature fluctuations. Liquids and debris are prevented from entering the burner compartment; instead, drippings are vaporized and used to add flavour to foods. Corrosion-resistant 304-grade stainless steel is used to construct SABER burners, cooking grates, and IR emitters. This material requires little maintenance – simply burn off the grilles after each use then wipe surfaces clean before next use. SABER grills are designed for efficiency, reducing cooking times while locking in moisture. The infrared cooking system allows you to cook faster with fewer BTUs, which can reduce gas consumption by 30 per cent. That’s good for your wallet — and the planet. Want to learn more about SABER’s unique grilling features? Visit our showroom for more information.